The Fourth Judicial District Commission on Judicial Performance unanimously (10-0) recommends that Chief Judge Gilbert Anthony Martinez BE RETAINED. Judge Martinez was appointed to the District Court, Fourth Judicial District, in 1989. After first graduating from the University of Colorado with a degree in Civil Engineering, Judge Martinez graduated from the University of Colorado Law School in 1977. Before he was appointed to the bench, Judge Martinez was in charge of the Colorado Springs’ Public Defenders Office. 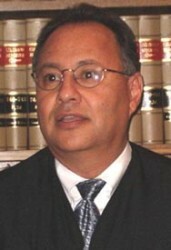 Judge Martinez served as Chief Judge of the District from 1994 to 2007, and then again from 2011 to 2016. Judge Martinez has a strong commitment to community service and participates in many volunteer activities including serving as a Judge for the high school Mock Trial program and for Teen Court. He frequently speaks at elementary and high school events and career days. At present, Judge Martinez primarily handles domestic relations cases. As Chief Judge, he supervises the probation department and is responsible for administrative duties in the trial courts. He also assists in the training of new Judges statewide. The Commission considered survey data and comments, an interview of Judge Martinez, courtroom observations, case management data and Judge Martinez’s self-evaluation. Of the attorneys who completed the survey, 76% recommended to retain, 5% responded not to retain, and 19% selecting neither option. Of all non-attorneys completing the survey, 78% recommended to retain, 15% not to retain, and 7% expressed no opinion. Judge Martinez scored higher than the statewide average for District Court Judges in the areas of case management, application and knowledge of the law, communication, and diligence. He continues to show needs for improvement in his demeanor scores, particularly with attorneys. Demeanor scores were 3.06 compared to 3.34 for other district court judges. The non-attorneys surveyed rated Judge Martinez as above average in all categories. Of non-attorneys 85% saw him as completely neutral and 88% balanced in his perception of leniency or harshness in sentencing. 50% of lawyers saw him as neutral in his bias between prosecution and defense while 50% believed the Judge was somewhat biased in favor of the prosecution. Appellate Court Judges surveyed saw his performance to be superior as compared to the average District Judge with a score of 3.75, compared to the 3.55 average. Judge Martinez has overall favorable reviews from the non-lawyers who appear before him. The Commission believes a continued focus on better demeanor would benefit Judge Martinez’s overall effectiveness.